One night in 2011, Uwimana Jeaninne retired to bed like any other. But the following morning, she noticed a small pimple had poped up on her forehead. Uwimana didn’t take it too serious because it was not the first time she would have a pimple on her face. In most cases pimples come and go. “I woke up in the morning and there was a pimple on my face. It was itching and I rubbed on pomade [liniment] but the pain just increased,” she narrates her ordeal. 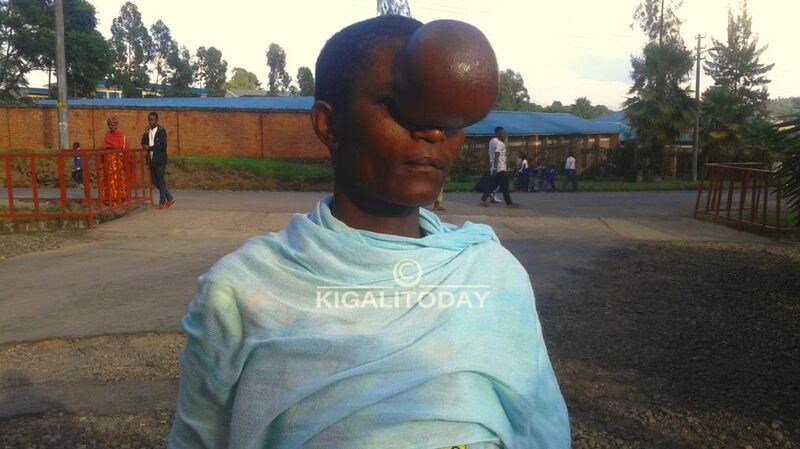 As days went by, Uwimana continued to feel very uncomfortable with too much pain as the pimple grew bigger. She sought medical help at Ruhengeri hospital which later referred her case to CHUK hospital dozens of kilometers away in Kigali city. However, due to financial challenges, Uwimana could not afford to travel back and forth between Musanze district and Kigali as the CHUK doctors set rendezvous with very close intervals. Sometimes she would travel to Kigali and in other situations she wouldn’t make it to fulfill rendezvous with doctors. “Up to now I don’t have any solution to my worsening condition,” Uwimana who is seemingly withdrawn tells of her plight. She remembers an encounter with a soldier who expressed sympathy and advised that she visits Kanombe hospital but Uwimana couldn’t because of lack of basic health insurance [mituelle de sante]. Uwimana’s troubles are not yet over because her husband kicked her out of their home. They have four children together. When she tried to return to her parents’ home, she was also rejected by her elderly mother. She later sought refuge at her brother but after a few days she was asked to leave. Uwimana is now living by the mercy of God as she describes her current painful life. A Pimple is a localized skin inflammation as a result of over activity of the oil glands at the base of specialized hair follicles.